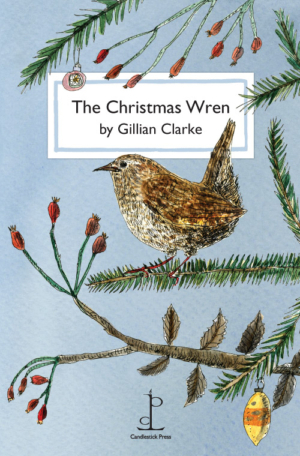 SOLD OUTWe’re very sorry but we’re temporarily out of stock of The Christmas Wren – however, you may still be able to buy copies at branches of Waterstones or at your local independent bookshop. We hope to have The Christmas Wren back in stock shortly. This year, to mark the centenary of Dylan Thomas’s birth, we are privileged to publish Gillian Clarke’s story The Christmas Wren, written in response to Dylan Thomas’s A Child’s Christmas in Wales. Commissioned by the Dylan Thomas Centre, the story is for adults and children, and is a magical tale of the Christmases of a Welsh childhood populated by aunts and uncles, snow and starlight, boxes and baubles. Gillian Clarke is a leading poet, and was appointed National Poet for Wales in 2008. Colour illustrations throughout by Lotte Beatrix Crawford. For the Welsh translation of The Christmas Wren, click here.